I hope everyone had a wonderful Mother's Day yesterday. Ours was very relaxing and low-key, which was exactly how I wanted it. After our church service, my husband and I went to a local nursery where I picked out some more flowers for my garden, then we just came home and had lunch and opened presents. 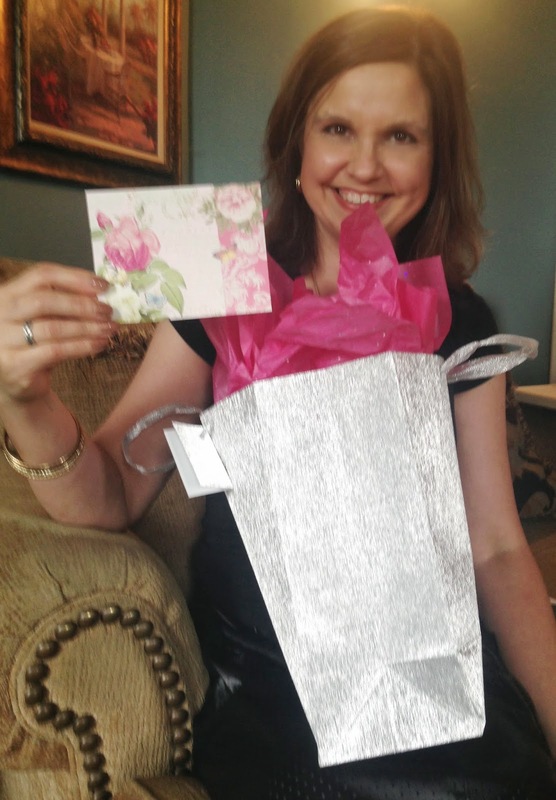 I love the sparkly bag, and floral card my daughter wrapped my presents in. Even the tissue paper has sparkles on it. I saved it of course! Way too pretty to throw away. Isn't that such a mom thing to do? 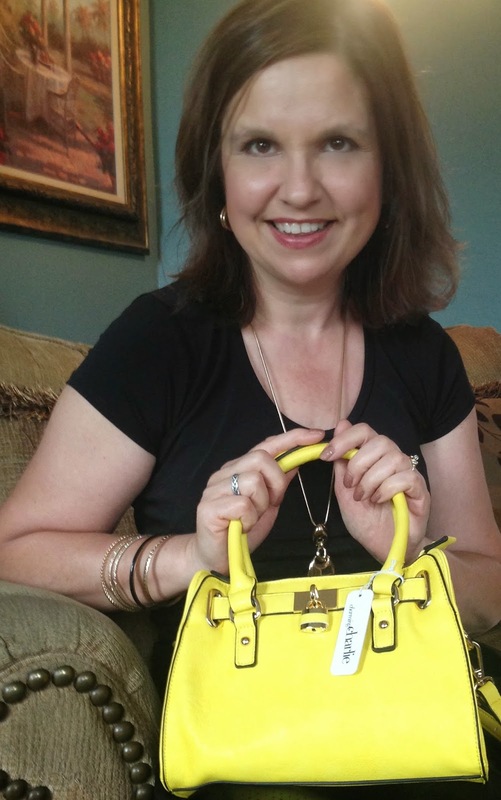 And inside the bag was the cutest, little yellow purse I ever laid ons! I have been trying to build some yellow into my spring wardrobe since it is such a hot color right now, but I have been having the most difficult time finding anything yellow I actually like. When I opened the gift bag and saw this little yellow bag I squealed "Yeah! I finally have something yellow!" 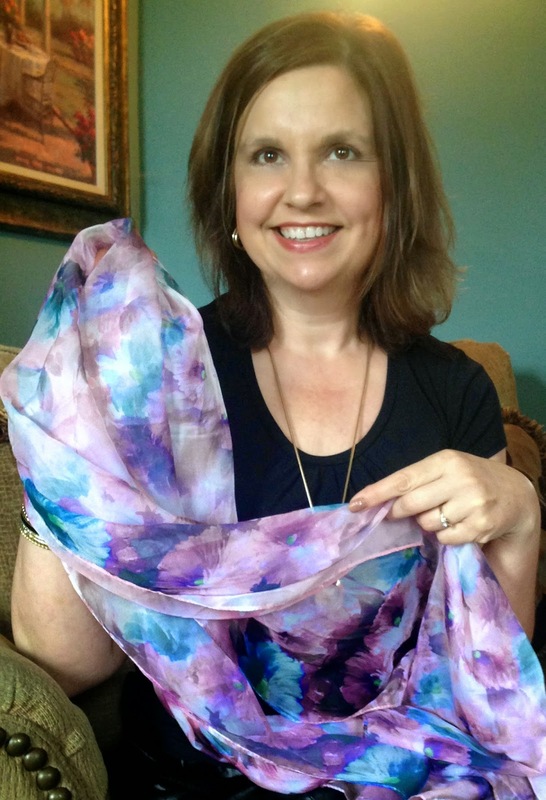 And Ashley didn't stop there, she included two beautiful, silk scarves as well. 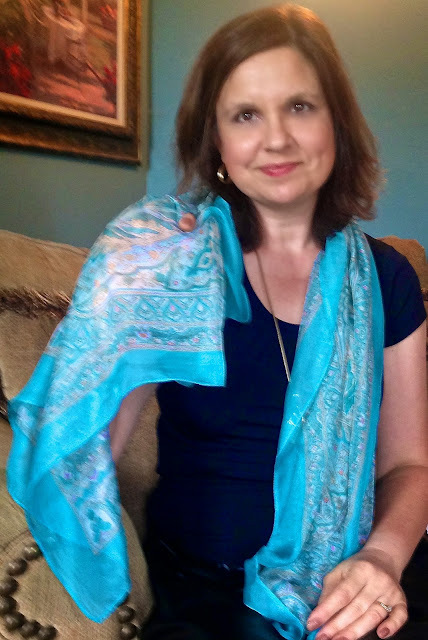 I have been searching for very thin, narrow scarves to wear in the spring and summer that are not too heavy, or bulky around the neck, but I couldn't find any where I live. These are absolutely perfect, for they will add just the right amount of warmth I'll need in the summer months to fight off the chill of over air-conditioned establishments. The first scarf is a pretty blue/teal, with an ornate design. And the second scarf is a lovely watercolor purple floral. Because we live an hour away from the nearest larger town, we actually had a Mother's Day dinner on Friday, since I was in town that day to shop anyway. We didn't want to drive back into town two days later just to eat, and I can't stand crowded restaurants on Mother's Day, so it was a nice alternative. My husband gave me a very generous gift card to use for my flower garden as my gift for Mother's Day, and I was able to buy six hanging baskets with it and many annuals to fill all my summer containers. So by now, Mother's Day was almost over. 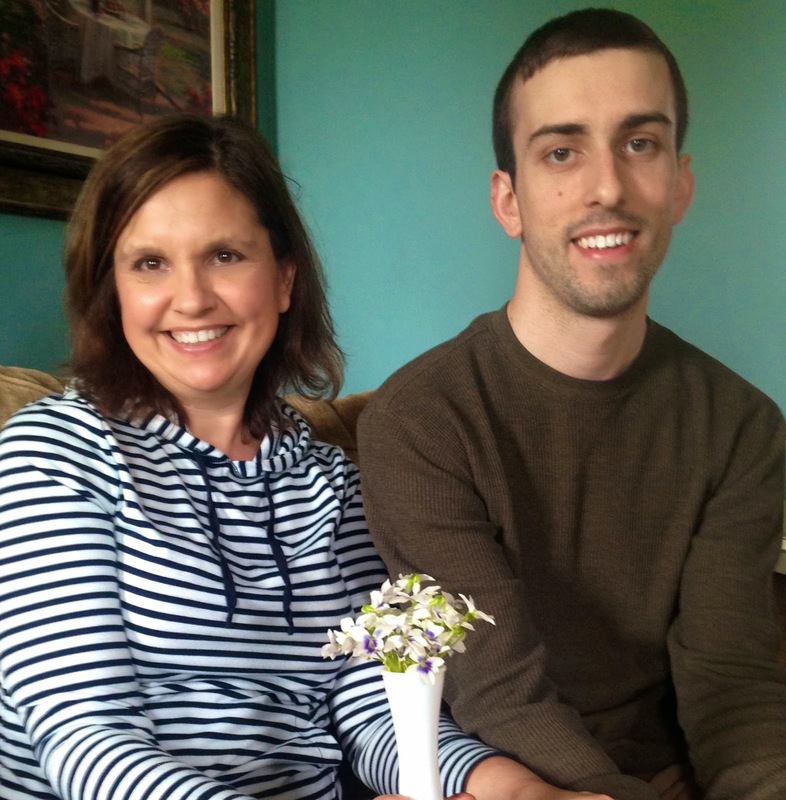 We had our celebration on Friday, we went to church, picked out some flowers, and opened presents and cards, but there was one person in my life, who hadn't wished me Mother's Day yet, nor given me anything: my son. So thinking Mother's Day was done, I just changed into my comfortable, at home clothes: drawstring pants and a cozy sweatshirt, and settled in my favorite 'spot' on my comfy couch, when in walked Jordan with the sweetest little bouquet of wild violets, a grin on his face, and his obligatory statement 'Happy Mother's Day!'. It was such a sweet statement, for the entire family new how difficult it was for him to say those three little words, and we all went 'Awwwww' and smiled and laughed at the exact same time. Well of course we had to take a picture, for we know how rare and special a moment like this is! There are many ways to share your love: this simple, sweet little bouquet of wildflowers hand-picked by my son, means just as much as to me as the gorgeous scarves and cute little purse hand-picked by my daughter does. Both were chosen and selected with great care, and both, are appreciated with great love. I hope you enjoyed my simple little Mother's Day Story. I would love to hear about yours. What did you do to celebrate Mother's Day? Wow ! you have had a super mother's day !!! Aww what a lovely surprise from your children. I love the yellow purse to the hand picked flowers. Happy Mothers day Amy! That was so sweet of both your children! Such a cute purse. Thank you so much for linking up on my site! I thought I would try something different for Mother's Day. I really should have talked about it a little before I launched it, but everything is so crazy right now. I hope you have a great rest of your week!